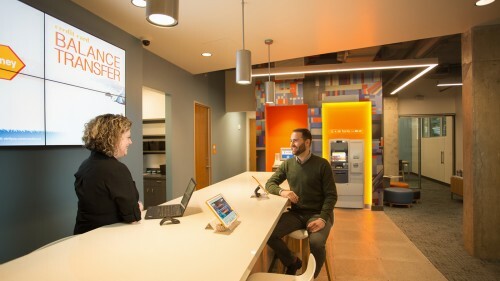 SEATTLE, WA (March 2, 2016) – Verity Credit Union celebrated the beginning of 2016 with the grand opening of its newest branch in Ballard, a thriving and vibrant urban community. This is their second branch based on a new retail prototype designed by Momentum. 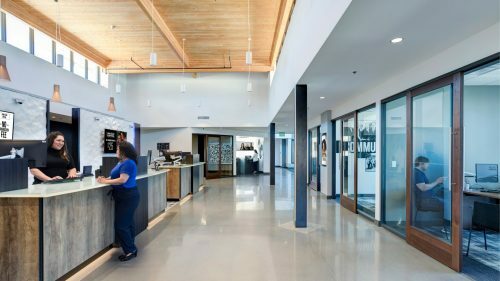 This branch embodies the feel of the Ballard neighborhood, featuring a large showcase of local art and a bright, open interior that is visible from the street and enhances the neighborhood’s colorful atmosphere. 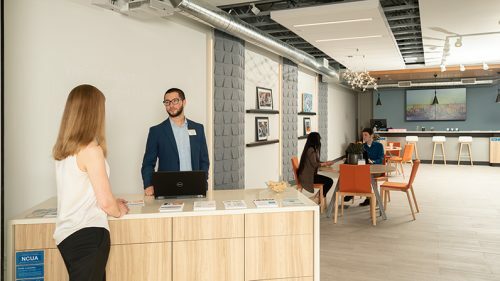 The young professionals that make up the neighborhood are already making good use of the unique space, including the “tool bench,” a kitchen counter style teller area, and a café style sitting area where they can have casual conversations with financial advisors. In 2015, Verity Credit Union launched a new initiative to support communities by featuring local artists in eye-catching displays at their branches. At the grand opening, Verity brought in local musicians Jeremy Serwer and Marina Christopher to entertain visitors under a chandelier made up of over three hundred lighted cubes that mimic the water features of Ballard, made by a local fabricator.